For the past 500 years, every century of American history has been marked by enormous changes and upheavals. 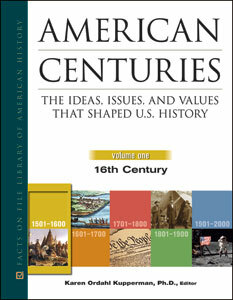 The five-volume American Centuries set devotes one volume to each century, covering all of the developments and transformations in U.S. history. Each volume features 30 to 40 in-depth articles on broad, heavily studied topics, such as war, race relations, government, and the economy. This century-by-century approach allows students to follow the growth, spread, and evolution of every major issue and topic in American history—from civil rights and childhood to the environment and urban life—from the 16th through the 20th centuries. By offering substantive articles that analyze critical subjects and themes in the political, cultural, economic, and social history of the United States, American Centuries provides students and researchers with a handy, coherent, and simple-to-use reference for study and research purposes. This easy-to-comprehend, curriculum-based reference set offers a unique, exciting, and accessible approach to American history. Students can focus on a single century, or they can examine one topic in-depth across five centuries. A distinguished historian in the field has edited each volume, and all articles are signed. Each volume contains 30 to 40 chapters averaging 2,000 to 4,500 words each and includes an introduction surveying the specific century, along with illustrations, maps, a chronology of major events, and tables and charts. A cumulative index connects all the themes and subjects across American history. Volume One—16th Century: Focuses on Native American life on the eve of European contact and early European exploration and settlement. Volume Two—17th Century: Focuses on life in Virginia, Massachusetts, New York, New Mexico, and other colonies as well as the establishment of European- and African-American institutions. Volume Three—18th Century: Focuses on the growing wealth, diversity, and population of the American colonies; rising tensions with Britain; the onset of the American Revolution; the establishment of the United States; and the creation of the Constitution and a new national government. Volume Four—19th Century: Focuses on western expansion and the disruption of Indian life; the spread and conflict over slavery and Civil War; the creation of a two-party system and extension of suffrage; and the growth of industrialization, urbanization, and immigration. Volume Five—20th Century: Focuses on the nation's rise as a world power and global leader in trade and technology; the growth of suburbanization, immigration, and an advanced economy; and the experience of two world wars and the civil rights movement.